A Literacy Blog - What a Great Idea! It looked like a good start for a literacy blog. The Read-TV blog had a serious literacy post, an inspiring post and I had future topics lined up and ready to go. But then the blog stopped. What happened? How Will I Reach My Low-Literacy Friends? After years of literacy work I finally had time to think about the direction I was going. I realized that, with the blog, I was focusing on the printed word. I was putting up literacy information in a text form. The people reading those posts would be....well... they would be literate. Low-literacy friends weren't going to touch this word-heavy, text-based literacy blog. How will I reach my low-literacy friends? I travelled back to an old idea that previously, I didn't have time to pursue. I will produce a video blog about literacy. Videos about literacy makes sense. It makes sense not only for those people with low-literacy but also for all you busy parents. A short video is something you can kick back and relax to and while learning valuable information. It's an enjoyable way to take-in information. I still love text so I'll provide transcripts for each episode for those of you that would rather read or skim the words. So far I have an animated introduction created by the wonderful Darren Heise - and I have tons of extra footage that we didn't use in the literacy DVD's that we can use here. I'm thinking about literacy topics and issues but I'm also thinking about the mundane. Should I host from the top of my desk, from my office chair or should I swing from the ceiling? Is this a reading-glasses-on gig for that smart (or bad eye sight) look or is this a contact lens affair? I know these are trivial matters compared to the literacy issues we will address - but I want to let you know I've been thinking about this blog - a lot. 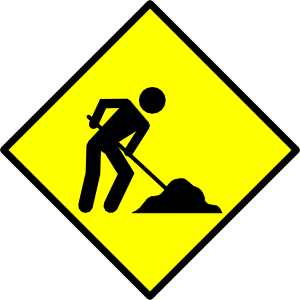 Consider this blog post a text version of that construction symbol. This post is my equivalent of a person digging a new road. That's me and that is this blog right now - under construction. But not for long - we'll see you in the video blog world in May 2010.